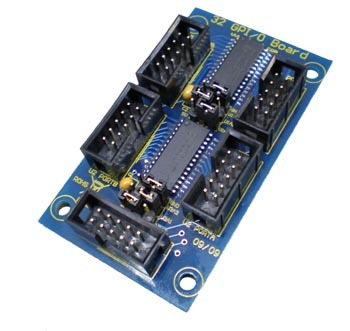 The GPI/O 32 Board is an accessory board that allows up to 32 I/O pins to be controlled through a single Port connection on Elexol’s I/O 24 Range. The Elexol I/O 24 Range consists of Ether I/O 24 R, Ether I/O 24 DIP R, USB I/O 24 R and the USB I/O 24 DIP R. The GPI/O 32 Board incorporates 2 x MCP23S17 GPIO expanders, which are split up into four 8 bit Ports (2 Ports per MCP23S17). This allows up to 32 I/O pins to be controlled via the Elexol I/O 24 SPI Protocol.